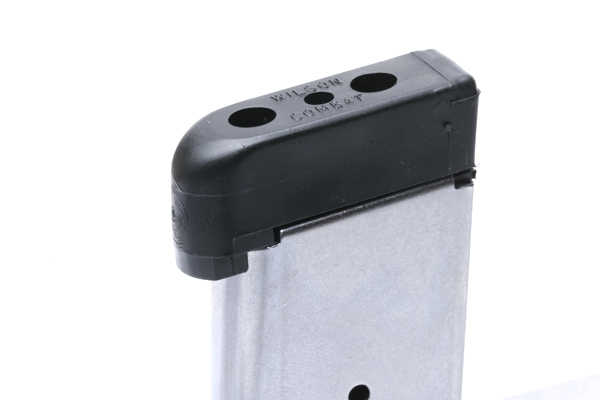 Wilson Combat has been supplying serious shooters and professionals with the worlds' most reliable and durable .45 auto magazines for the past 30 years. They are used by the worlds' most Elite U.S. Army SPEC OPS unit, FBI SWAT, Thunder Ranch and professionals worldwide. NO other .45 magazine on the market can compare for proven inherent reliability, durability and the ability to remain fully loaded for long periods of time without damage. Our magazine springs are specially fabricated from the highest tensile strength heavy duty spring wire for long service life enhanced feeding and positive slide stop operations. Our magazine bodies are manufactured from .027" (the thickest in the industry) aircraft grade certified 17-7 PH stainless steel and heat treated for maximum durability and service life. Our dimensional tolerances are held so close that you will never encounter a Wilson magazine that doesn't drop free from your pistol or that your rounds are tight inside the tube as long as your pistol and ammo are close to proper specifications. "Back in 1980, Bill Wilson asked me to test some of his new Wilson-Rogers .45 magazines. He explained that he felt they had solved the problem of cracked feed lips and that their new magazines fed much more reliably than any others on the market. Well, it's 30 years later now and I'm still using some of those original 6 prototype magazines that Bill sent me Through the years they have proven without a doubt to be the most reliable and durable 1911 magazines on the market. I have personally used specimens from various production runs through the years and have yet to see any quality variation or have one let me down in any way. They are my first and only choice as well as the choice of the elite special forces units I train. I trust my life to a Wilson Combat pistol and 8-round Wilson magazines; so can you"
When Wilson Combat says their magazines increase reliability in all 1911 pistols, they are exactly correct. I have built and re-built all levels and brands of 1911s, and Wilson mags are the ONLY ones I would EVER use for competition or protection. If you have ANY feeding issues with your 1911, switch to Wilson and you will see a difference. From $200 guns to $4000 guns, these magazines HELP! Flawlessly feeds even the oddest hand loads with ease, where other mags choke and these keep on running. Durable design, easy maintenance, they even have numbers on the base pad to paint an I.D. code. I highly recommend these and will be getting more in the near future! 1#47DE, 200 Rounds, Zero failures, Period!.. I ordered 1 #47DE with extexnded base pad. I fired 200 rounds with only this one magazine. There were no failures of any kind with the added feature of being able to load all 8 rounds even with my old hands. Ive had 1911s since 1971 and this is the first time I have not had any magazine failures. That is the mark of quality. Im going to buy many more. PS If I win the lottery Ill buy one of every CA Legal Wilson 1911. I bought 2 of these back in January of 2011. I recently encountered a problem with one and was able to send it back to Wilson and they are replacing it. I will be a customer for life. There is a reason why Wilson Combat has such an untarnished track record for customer support and integrity. Definitely a high end product and a must to keep your 1911 running flawlessly. Thanks Wilson Combat for making such great products and backing them up as well! 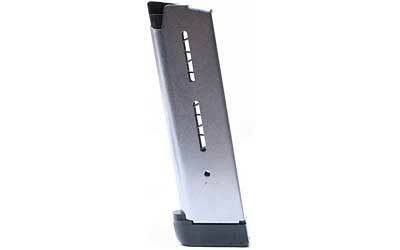 Among the premium magazines available for my Kimber Pro Carry - I opted to order 3 of these to fulfill my carry needs. Got them today, theyre exactly as described, solid and well-made. Highly recommend! Best Magazine Ive ever used!.. I got tired of destroying followers in some KimPro TacMags I had purchased at the time I bought my Kimber Warrior II. I purchased several Wilson 47DE mags and they have been fantastic!!!! Easy to load, and always reliable! I ended up installing the Wilson spring and follower kits in the Kimber mags and they were greatly improved, but still not as good as the Wilson mags! PS: I will never buy a Kimber pistol again either..... Poor quality control and even worse customer service. I had 8 wilson 47de mags that I have been shooting in IPSC for the last 18 years. I returned them to see if they would be covered under warranty. Yesterday I received 8 brand new mags. I couldnt beleive it. After 18 years of hard use I get new ones.